We love items that work well in lots of different spaces! 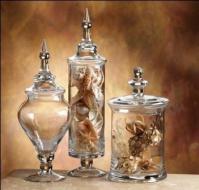 This Set of 3 Apothecary Jars is your opportunity to accessorize your home with your personal style. The set consists of 3 different sized jars, that can hold an assortment of accents. A colored candle, shells, dried flowers, pasta, and fragrant potpourri are just a few ideas. It is quick and easy to freshen your decor by changing the items you display in them seasonally. A perfect accent for your kitchen, bathroom, bedroom or living room. For more details visit www.cheapchicdecor.com.